With the RST model, we've literally helped hundreds of thousands of golfers dramatically improve their golf swings. You've seen all the testimonials, where people are going from a 16 handicap to a seven, in six months. How is that possible? And how come some people don't achieve those same results? And that may be what you're thinking right now. "Hey, I've been watching all of these videos for the last two years. I've seen every single video. I know everything that you say. How come I'm not seeing the same improvement that some of these other guys are?" There's one reason and one reason only. And this is one thing that I can't emphasize enough. If you don't understand anything else about this site, but you listen to this one point, this is going to make the biggest difference in your game. You will not improve your golf swing at all if you just watch the videos. That is a huge misnomer. Just watching the golf instruction videos, by themselves, is completely useless. It's not going to help you improve one bit. Literally, you're not going to get any better just by watching the videos. You don't learn through osmosis. This is not an intellectual endeavor. That's part of it, and in the clinics, I always talk about there are two goals that we want to accomplish in the clinic. The first half of the clinic, which is a little weird for a lot of people at first, who've gone to other golf schools, is it's all inside. You don't touch a club. You sit and you learn, which is what you're doing when you watch the videos. We give you a bunch of intellectual knowledge that you need to understand what it is you're trying to do. But the second half of the day, is taking that intellectual knowledge and transferring it into kinesthetic awareness. And what does that mean? It's teaching your body how to move correctly. You don't do that by sitting on your bum, watching a video. How do you do that? There's one training aid that is more important than anything else you will ever buy, or you may probably already have one or several in your house right now, and that is a mirror. Nothing is more valuable to helping you get a much better golf swing than this. Now, this is a big one that we use at our golf school, at The Ritz-Carlton here in Orlando, but we sell these little ones on the site. If you want to practice outside on the range, you can stick that thing in your golf bag. But I guarantee you, you probably have something in your house that is a mirror that you can use to see what you're doing. This is the key. People do this every single clinic that I have, every golf lesson that I give. Come to me and say, "Dude, I love your site and I love all the videos. It's awesome. I totally get it, but I'm still struggling a little bit." I say, "Okay. Well, how much do you practice in front of the mirror?" "Well, I never practice in front of the mirror." "Okay, so you must video your swing a lot?" "No. I've never seen my swing on video?" "Hello? How on Earth do you know what you're doing?" There's two things that I laugh about all the time when it comes to golf lessons. One, is somebody who shows up to the lesson and says, "Hey, all right. I'm loosening up here, but I got three different swings. Which one do you want me to do?" Don't ever say that in a golf lesson, because the instructor, who is any good, is going to laugh at you internally. Hopefully, not laugh out loud. I try to avoid it, but because we know that all three of the swings that feel completely different to you look exactly the same on video. The video never, ever lies. The second thing that I laugh at is, when I finally do show somebody their swing on video and they're like, "That's not me." "Do you think I went and dressed somebody up to look just like you today and video them before you showed up, so I could trick you into [inaudible 00:03:27] your swing?" The catch is, nobody, and I mean nobody, actually does what they think or feel they are doing. Feel and real are not the same until you train your feel correctly. And the only way that you can train your body how to move correctly is to see what you're doing. You can't just read about it or watch a video and expect to get better. I always tell this story, when I give the golf clinics, about Tiger Woods. When he was making a change from Butch to Hank Haney, whether you agree with their philosophies or not, it's irrelevant to the story. And, whether you even like Tiger Woods or not is irrelevant to the story. What's important is, Tiger Woods understood how to learn a movement pattern better than anybody else in the history of the game. That's why he was able to make such huge changes to his swings, visibly different changes. Your swing probably hasn't looked any different in the last 20 years if you're still struggling. He made visible, huge changes to his swing. How did he do it? Well, one of the benefits of living in Orlando in Windermere, is that I've seen Tiger hit gazillions of balls at [inaudible 00:04:34], because I taught over there quite a bit. Had a lot of members who were students of mine over there, so I've hit balls next to Tiger a 1,000 times. Watching him practice during that phase, was a real eye-opener for me, because he didn't hit very many balls. In fact, I'll give you a true story example. I've watched him hit balls for ... Well, excuse me. Watched him practice for 45 minutes one day, while I was hitting next to him, pounding balls myself. And all he did for 45 minutes was this. For 45 minutes straight. He never once hit a ball. He never once went past that position. He did it slowly at first. He stopped, checked his position every single time. He didn't just go over here and do a bunch of reps and say, "[inaudible 00:05:26] this is good. I'm learning something new here. This is great." He did it diligently and focused to make sure that he could feel what he was doing was correct. And I'm certain, that he did a lot of this work indoors in front of a mirror before he ever took it outside. And that's the key to practice. Everything with Rotary Swing is meant to be done indoors first. You don't need a club. All you need is your best friend, the best training aid in the world. A mirror. If, when you do the movements, they look exactly when I do the movements in the video, you're on the right track. If they look anything different, you're not on the right track. How are you going to know if they look different? A mirror. That's the only way. It's the fastest way to improvement. So please, please, if you're serious about really making a huge change to your golf swing this year, and making this year that you drop that 10 strokes off your game, practice the way that it's laid out on the site. Don't ever watch a video and then go straight to the range and work on it full-speed, because I guarantee you, you're not doing anything like what you think you are. You've been warned. I promise you, what you feel and what's really happening, are never the same. Unless you've done it in front of a mirror a bunch, hundreds and hundreds of reps, to develop the correct feel, you're always going to be struggling with your game. There's a simple fix for it. Do everything first in front of a mirror, without a club, exactly the way that I laid it out on the site. So if you're working on rotation, there's no club. Arms across your chest. You're not even allowed to use your arms. You're going to shift and turn. Shift and turn. You're doing that in front of a mirror, watching ... And another thing that cracks me up, when I have students in my golf lessons, who I put them in front of the mirror and they look down at the ground the whole time. The mirror is not there to reflect the sun on you to help you work on your suntan. The mirror is there for you to look at yourself and see what you're doing. So please, as you're standing in front of the mirror, look at yourself and say, "Okay. Well, my hip's sliding out. Chuck's isn't. His isn't doing that. And I know, because I've watched the Right Hip Line video, and I need to shift into that right, and not let it slide. Oh, my axis is going off, et cetera, et cetera." All of these things, are going to dramatically speed up your process when you watch yourself in front of a mirror. So please, please, please. Don't just watch the videos. That's not going to help you get any better. If you're serious about getting better this year, find a mirror in your house, find some place you can get a reflection. Grab one of the small mirrors that we have that you can stick in your golf bag when you are going to practice on the range, and I guarantee you, you'll get better. 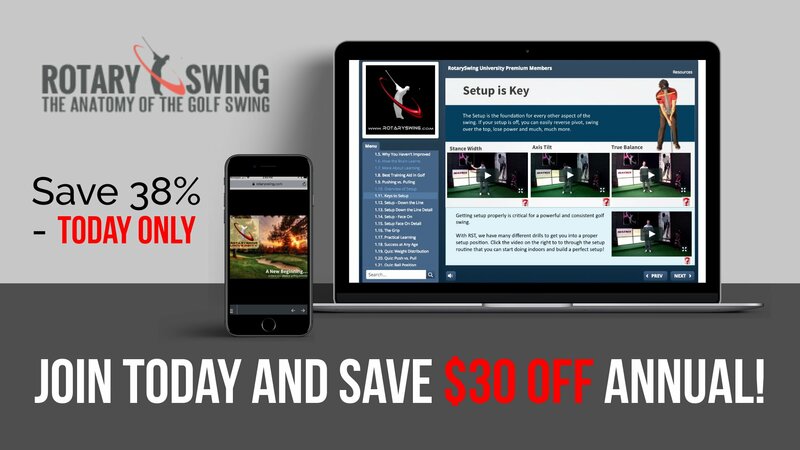 Get Your Free Membership to Finish Watching "The Best Training Aid in Golf" Right Now!